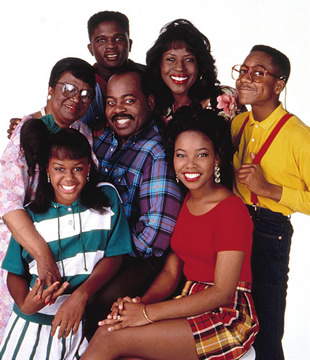 Debuting on ABC, Family Matters began as a spin-off to the Perfect Strangers sitcom. JoMarie Payton, in the role of Hariette Winslow, proved to be so popular that William Bickley and Michael Warren created a show revolving around her character. 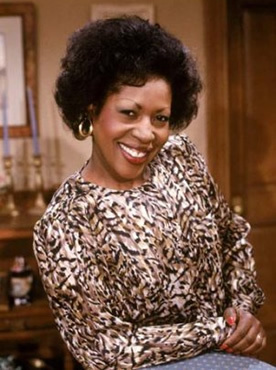 Family Matters followed the straight-talking and sassy Harriette in her Chicago home where viewers got to see she and her husband as parents and managing a household. Married to a police officer named Carl (Reginald VelJohnson), they raised three children; Eddie (Darius McCrary), Laura (Kellie Shanygne Williams), and Judy (Jaimee Foxworth). Harriette’s widowed sister, Rachel Crawford (Telma Hopkins), her young son Richie (Bryton James), and Carl’s mother Estelle (Rosetta LeNoire) live with them. In the 12th episode, nerdy neighbor Steve Urkel (Jaleel White) was introduced and intended as a one-time only character. He proved so popular with the audience that he became a recurring character and then a series regular. It wasn’t long before each episode featured an Urkel-focused storyline. It’s often been said that some in the cast were not pleased with this shift in focus. Payton left midway through the last season (replaced by Judyann Elder), and it’s been reported and rumored many times that the Urkel storylines were the reason. We recently spoke with Payton to set the record straight. Going back to the end of the seventh season of Family Matters, the show switched from ABC to CBS. Do you remember why that happened? Well, you know, I think it probably was because the show was kind of running out of air, what they call “jumping the shark,” you know what I mean? I know that prior to that, a year prior to that, I didn’t want to do it anymore. I had been offered an opportunity to do the Mahalia Jackson story and I wanted to do something else. And I think, like, four, three, four years prior to that I would go into ABC with my agent every year and we would ask for just another project, something else to do. Like, Bob Sagat was doing America’s Funniest Home Videos. I just wanted something else to do, just to energize me a little bit more, on the creative side. And so I wanted to leave before that and so at the end of the eighth season, which was my last contracted year — I think I might have had one of the longest contracts there — my contract was up. So I was like a free agent and so when they went to CBS and all, they asked me to come back. And I really didn’t want to come back. I had just done my jazz album and all. And we agreed that I would come back just to kick off the move to CBS and that’s how that whole deal went. I was to do half of a season, eight of the episodes. And I had an option out and I exercised my option. I did. As a matter of fact, I had long talk with [co-creator] Bob Boyett prior to my leaving, and he asked me, “When you said you really were ready to go, you were ready to go, weren’t you?” And I said, “Yeah, but they weren’t ready to let go, you know.” And so, I know there were a few people that were a little bit upset that I wanted to go, but I was just ready to leave. I was ready to go before then, but, I actually remember having one of the people that were working there, one of the production people, saying “Jo, if you leave then you know things are going to go crazy.” And, “Yeah, I have a daughter in college” you know, and this and that. And so I stayed an extra two years. I felt stifled and like I said, if I had been able to do other projects… There was one time that they agreed to let me do another project and then the project got delayed and then when it was time to do it they said, “No, you can’t do it.” So, I just needed something extra to do, you know. How I explained it is, “A baker that loves to bake doesn’t want to stop baking. They just don’t always want to make chocolate cake or chocolate cookies. They want to try to do something else. Bake some bagels, do something else.” I never wanted to stop acting. I’ve been acting since I was six years old. It’s just that I was tired of doing that project, you know what I’m saying, I wanted to do something else. I think the reason why some people have thought there was a problem was because you left mid-season, which was unusual. Could you talk about when the show started to focus on Urkel? You know the whole thing was our show had been picked up for the back 9 [episodes] and we had done 12, and we were told by our executive producers. If I remember correctly, it was Bill Bickley and Michael Warren that called myself, Telma Hopkins, and Reginald VelJohnson, together and told us that ABC liked the Urkel character so much they’re going to make all of the shows about him. That was in the first season. I was there for eight and a half years! We said, okay. Well, what are we going to say? We were all happy to be working, and he made the show go, and we’re all still happy about it right now. We’re still laughing to the bank with the residuals. So it may have caused a little conflict, just because… it was a real shocker to all of us, you know what I mean? Because he was this little character and we had just gotten to know each other and I didn’t know Mr. VelJohnson or Telma prior to that, I didn’t know any of them prior to that. So we all had gotten together, we had done 12 shows, and we were a little family, so we had learned to know and like each other and communicate, and relate and energize with each other. And then Jaleel came in and it was fun to have him there and all, but of course it did the same thing Happy Days did [with the Fonz character]. You know what I tell people? He “jumped” out of Family Matters, but I “jumped” out of Perfect Strangers, you know? It was just a different kind of “jump.” But I understood some of what he was going through because I felt a little something when I was told that I was getting a [spin-off] show. I got a little bite, you know, from some of the people from Perfect Strangers. Well, one in particular, you know, I got a little bite and it was mean and nasty, and I was the only African American on that show so I was feeling like the lone ranger for a minute. So when Jaleel’s character “jumped” out I understood that. You know? And as you say, the show was a success. Like I tell everybody, I prayed for a blessing. I feel like everybody that was in that production came along in my blessing, because I was the one praying up front when the church was available. And I was down there on my knees praying for it to [succeed], you know. Even when people thought it wasn’t going to make it, I believed in my heart that prayers are answered and I needed something to happen. I had a little baby and I wanted a home. I was staying in an apartment. I just believe it was a blessing, so I went along with it. Whatever it was, I went along with it and I like I said, I don’t think anybody’s going to keep me or anybody on their job or on payroll for 10 and a half years that was a problem for them. I worked for Miller-Boyett and ABC/Disney for 10 and a half years, you know? And then I worked for them again on the Proud Family. I think did 52 animated shows for them and five shorts for Disney. I think that maybe my leaving, like I said, it kind of upset a few people but like I said, you know, it was time for me to go. It was time for the show to go, I wish we could’ve gone down maybe a little bit earlier, so maybe we could have gone out with the [finale] that everybody feels like, we missed, you know what I mean? For such a long-running show, it doesn’t seem like the show was given a lot of respect in some ways. We were kind of looked down on and I remember Kels (who played Laura) asking me, like in the 4th season. She said “Ms. Payton,” with the big eyes, she said “Ms. Payton, why don’t we get any coverage, why don’t people acknowledge us?” And I said, “You know something, sometimes it’s not too good to be too good, but we’re going to be good all the way to the bank.” And that’s what we did. We were good all the way to the bank. And one of my producers on a project I am on now, he said he was in his office and his kid came in and said “Dad, Dad, you’ve gotta see this show! You’ve gotta see this show about this kid called Urkel” and his dad said “Thats an OLD show, I watched it when I was your age!” (laughter) So, its amazing, its an amazing show. And you know, every show has its ups and downs, and you have your little arguments, you have your little egos, and all of these other things that go on, you know, but you know, its a blessing to be in any project, regardless of what it is, a TV show, a play, or a whatever, you know, anything artistic, to be in it, and have it be a success and have people still admire what you did and all. 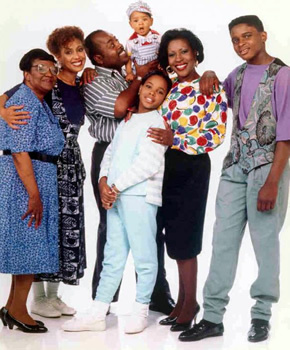 I love the show but Harriett’s replacement was horrible just like the replacement of Vivian on the Fresh Prince….both of the original cast members were blunt, funny & meant business but their replacements were boring. The Harriet replacement was not only bad on FM she was bad on Martin & the Player’s Club. I still watch all the re runs on tv they play every night from like 10pm until 1am and no I like the original cast. It’s everyone’s right and choice to leave… but like Bewitched there could never be another Darren, just like Family Matters there can never be another Harriet. I love, love, love the show!! I never thought I would, but I do! It takes me all day to watch it, be I pre-record all episodes, and watch them at MY leisure! ☺ I have some that are my favorites, because they make me laugh hard! I was in need, of a good laugh the other day, and I turned on one of my favorites! ☺ I laugh all of the time! ! I hope to see you on TV again! God bless you! It was bad enough when Jaimee left but then having the original Harriet replaced that was just going way to far for me to handle. Have a good one Jo. I’m watching the eepisode where Steve stands up to a bully. Harriet was good, but let’s be honest: We watched for Urkel. The show was a bit too boring in the 1st season without him. Doesn’t matter, Harriet was the reason the show even happened, where’s her respect? I actually hated Urkel, he was so annoying. I watched because I liked Harriet from Perfect Strangers, I watched for the rest of the family, I also Liked Telma Hopkins, I would have watched if Urkel wasn’t on. Her character was the main reason I watched the show. Steve was annoying. You were the reason people watched that show. Many blessings in your future.